Location - State where calls were delivered during report time interval. 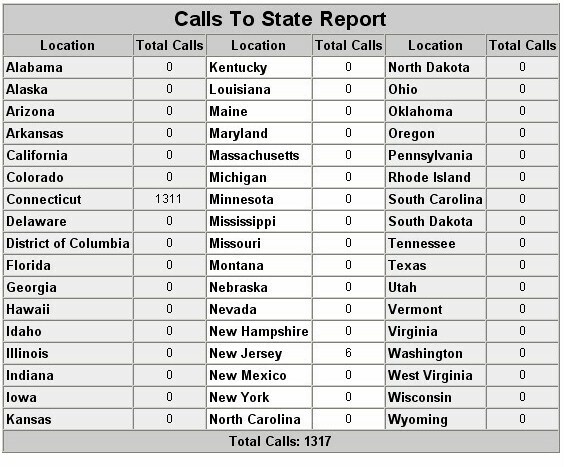 Total Calls - Total number of calls attempted to each state location during time interval of report. DSC offers telephone messaging phone systems for virtually all types and sizes of organizations. Our phone message delivery system includes a modern Windows PC with telephony technology from Intel / Dialogic. When combined with our internally developed IVR software, these phone systems can perform both inbound call distribution as well as outbound telephone messaging campaigns. The WIZARD Voice Broadcasting System is our entry level call center phone system that supports up to 48 analog phone lines. If your telephone messaging center requires faster delivery to a larger audience, our PACER phone system can be used to deliver messages using hundreds of digital phone lines.